LAS VEGAS, NV--(Marketwired - January 08, 2018) - Energous Corporation (NASDAQ: WATT), the developer of WattUp®, a revolutionary wire-free, power-at-a-distance charging technology, today announced new WattUp chipsets with manufacturing partner Dialog Semiconductor, a leading provider of integrated circuits (ICs), that will accelerate availability of WattUp wireless charging to partners and the market as a whole in 2018. In an industry-first, the new chipsets include the critical Beamforming IC, DA1210 and the Power Amplifier (PA) IC, DA3210. 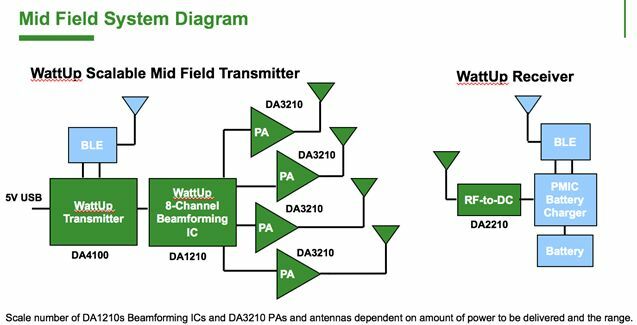 Energous has also updated the fully integrated Transmitter IC, DA4100,and the DA2210 to support the 900MHz frequency band, which together complete the WattUp Near Field and the recently FCC-certified power-at-a-distance WattUp Mid Field wireless charging systems. "The combination of FCC certification of our WattUp Mid Field power-at-a-distance transmitter and our strategic partnership with Dialog, coupled with a rapidly expanding customer base, uniquely positions Energous to bring true wireless charging to the consumer on a massive scale," said Stephen R. Rizzone, president and CEO of Energous. "The new end-to-end chip solution showcased at CES this week, exclusively distributed by Dialog, will provide our customers and partners with a turnkey solution that will simplify integration and accelerate adoption of the WattUp technology." "We built a new and unique family of IC devices that will kick off the development and deployment of first-generation power-at-a-distance products under FCC Part 18 rules, and leave its architectural legacy in future IC device generations as the technology continues to evolve," said Cesar Johnston, executive vice president of Engineering at Energous. "Our devices are the only custom-built and cost-optimized IC devices designed to support the demands of power-at-a-distance transmission solutions, and we are excited about the opportunity this will open up for partners and the market in the year ahead." 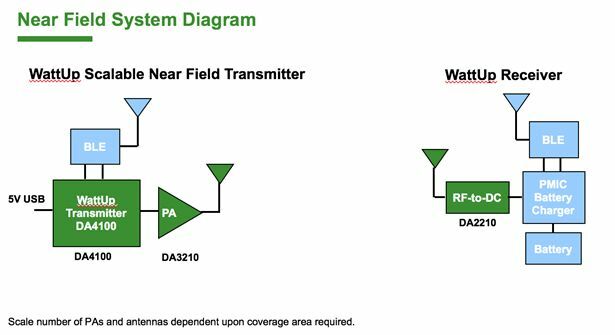 DA4100 is a fully integrated Wireless Charging Transmitter IC, with newly-added support for 900MHz, along with legacy support for 5.8GHz frequency bands, providing the heart of a WattUp Near Field or Mid Field transmitter. DA3210 is a 900MHz, high-power, high-efficiency RF Power Amplifier optimized for driving antennas in WattUp Near Field and Mid Field transmitters. DA1210 is an 8-channel Mid Field beamforming IC that pairs with a DA4100 transmitter IC, and typically drives four to eight DA3210 Power Amplifiers depending on the range and power requirements of the system. Multiple DA1210s can be added to the system to increase the number of transmit antennas. The DA2210 is a high-efficiency, 4-channel RF-to-DC rectifier IC that connects to the receive antenna in a WattUp-enabled wireless charging receiver, converting RF power to DC, to power BLE, battery chargers and other circuitry. DA2210 has newly-added support for 900MHz along with legacy support for 5.8GHz frequency bands. The scale number of power amplifiers and antennas is dependent upon the coverage area and power required. The scale number of DA1210s Beamforming ICs, DA3210 power amplifiers and antennas is dependent on the amount of power to be delivered and the range requirements. Energous will be taking private meetings and demos at the Venetian, alongside Dialog, on an appointment-only basis, at CES 2018, the world's largest consumer electronics show, January 9-12 in Las Vegas, NV.